I spent half my day at the State Fair today, which just makes me think "holy crap" because that could not possibly have been a year since I last did that... and yet it was. Criminy. Today is my 24th anniversary with chickens. Yes, July 29, 1987 was the day I got my very first birds, a pair of Spangled Old English Game Bantams. So, that means this is my 22nd year showing at State Fair! I took two birds in today for the open poultry show, a Black hen and a Black Breasted Red hen. I don't expect to do much damage with them. There are not a lot of birds there (a hundred?) and they're all in fairly equal states of un-condition. This is NOT prime time for poultry. This is the time of year when birds lose all their feathers. State Fair is a big deal for other animals species, but is not a big deal in the poultry show world. The "fair circuit" is not part of what us chicken people would consider the show circuit. But it's still nice to win, and who doesn't love golden bear trophies! The trophies are awesome. I show just for the chance at winning one. That and it's tradition. Speaking of traditions, State Fair is full of them for me. Like cinnamon rolls, for example. My fair day must begin with one of those giant freshly baked cinnamon rolls, preferably eaten in the company of a particular one of my "fowl" friends, so it was lovely to do that this morning. :-) After that though I was on my own, so I had to do things like play "find the bad taxidermy" all alone. Not nearly as fun as a solo venture as it was years ago. State Fair used to be absolutely teeming with bad taxidermy. Nowadays, not so much. Last year I don't think I found any. 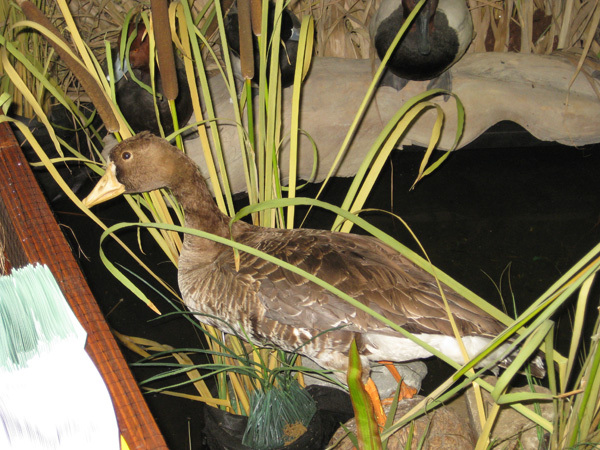 This year I found one county exhibit that was just bursting with poorly stuffed waterfowl. Glee! I had nobody to share my glee with, but I took a picture for proof! Anyway, there are things about State Fair that I love. 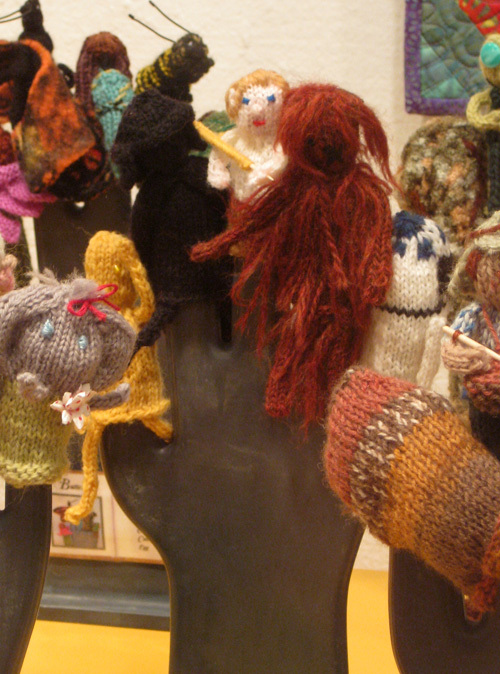 The animals, the arts and crafts... well all the handmade stuff really. And there are things I hate about the fair. All the commercialization, I just avoid all the vendors. The "good old fashioned" parts of the fair seem to be a small part of it, but they still exist. There was a whole building dedicated to a display of fair nostalgia this year, that was cool. A glimpse into the glory days, when it really WAS about agriculture and competitions and livestock and home-made stuff... you know, all the things that fairs seem to want to do away with now! It has changed even since I was a kid, the animal shows are way smaller, the horse display was pathetically small this year. I don't like to see that change. And yet every year I say "I don't know if I'll show there again next year." I really never do know from year to year, just depends what's going on and what condition the birds are in! I still say the best fair I have ever been to was the one I went to in England. Now THAT was what a fair should be! Do they still make them like that in the US? In California? Here are the links to the pics of the fair in England that I went to back in 2006. Here, here, here, here, and here! Here are a few of the things I saw today that made me smile. 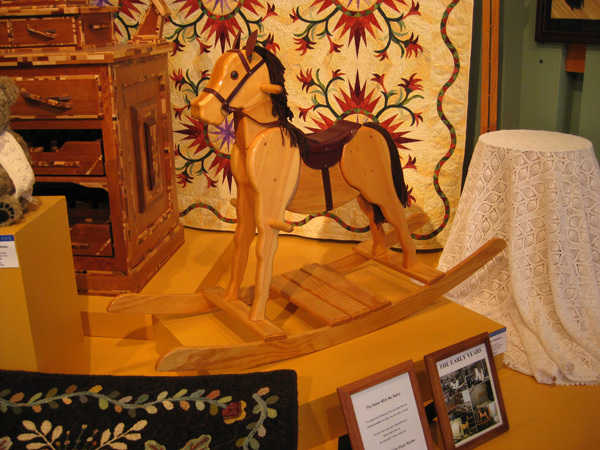 A handmade rocking horse! That's awesome. Speaking of rocking horses, there have been a few for sale on CL lately that I'm oh so tempted to buy and restore, but really, I have enough to do! 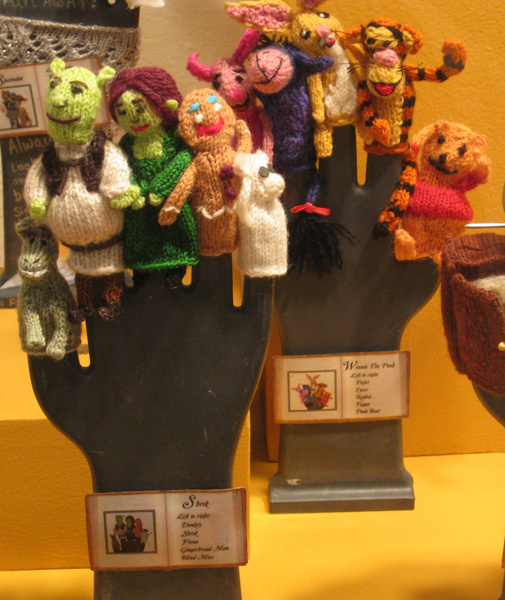 Handmade finger puppets. Shrek! Look at Puss n Boots with the big eyeballs, OMG I about died of cuteness overload. And Star Wars! 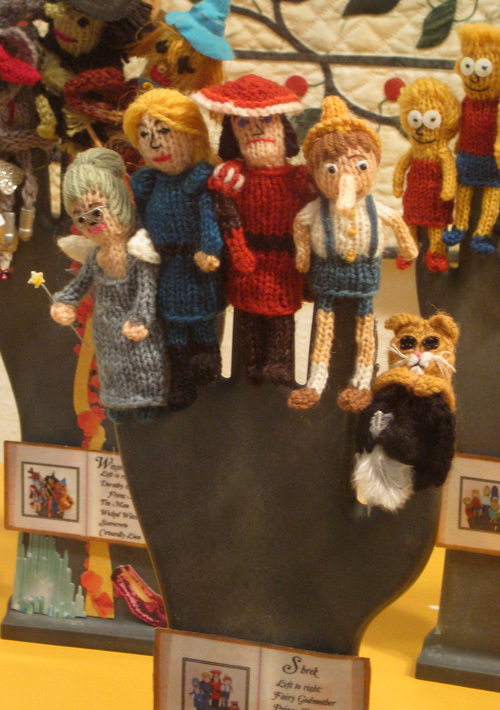 Chewbacca as a finger puppet, gah! Well, I wrote a really long and detailed response to this, probably more like a diatribe, but Blogger chose to dump it. Well heck, I'm sorry. But now I wanted to know what you were going to say.